Learn more about “Gnome” Chomsky’s! (this photo of “Gnome” Chomsky is courtesy of Sara Bershtel, publisher of Metropolitan Books). 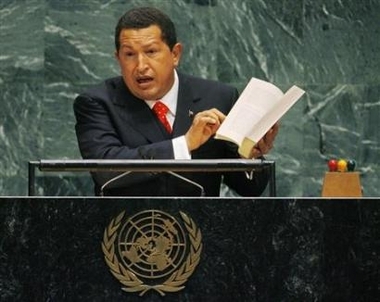 President Chavez of Venezuela spoke to the UN General Assembly earlier today. During his remarks he held up a copy and recommended that everyone read Noam Chomsky’s Hegemony or Survival. Here is the transcript of his comments. "It’s an excellent book to help us understand what has been happening in the world throughout the 20th century, and what’s happening now, and the greatest threat looming over our planet. The hegemonic pretensions of the American empire are placing at risk the very survival of the human species. We continue to warn you about this danger and we appeal to the people of the United States and the world to halt this threat, which is like a sword hanging over our heads. I had considered reading from this book, but, for the sake of time," [flips through the pages, which are numerous] "I will just leave it as a recommendation.